At Christy HQ, we love chatting about all the silly and funny things our pets do! 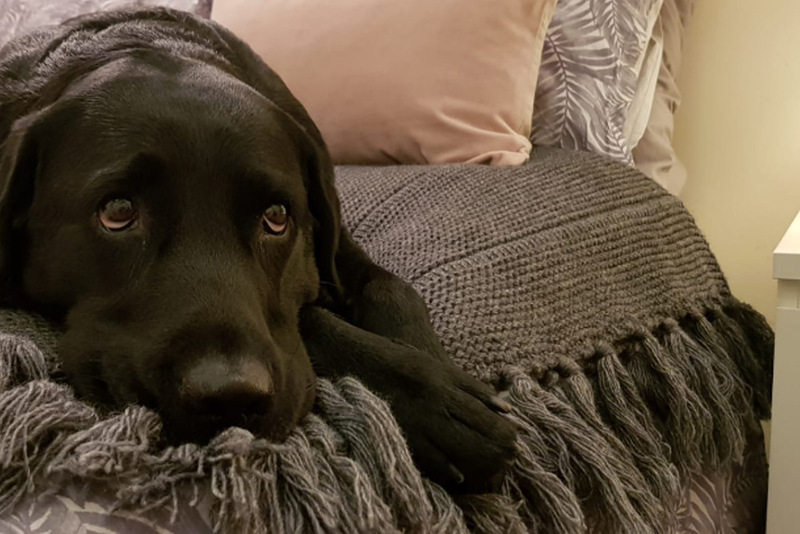 So to celebrate #LoveYourPetDay, we asked team Christy at Christy HQ to send us the cutest shots of their furry friends relaxing on luxury in true Christy style! 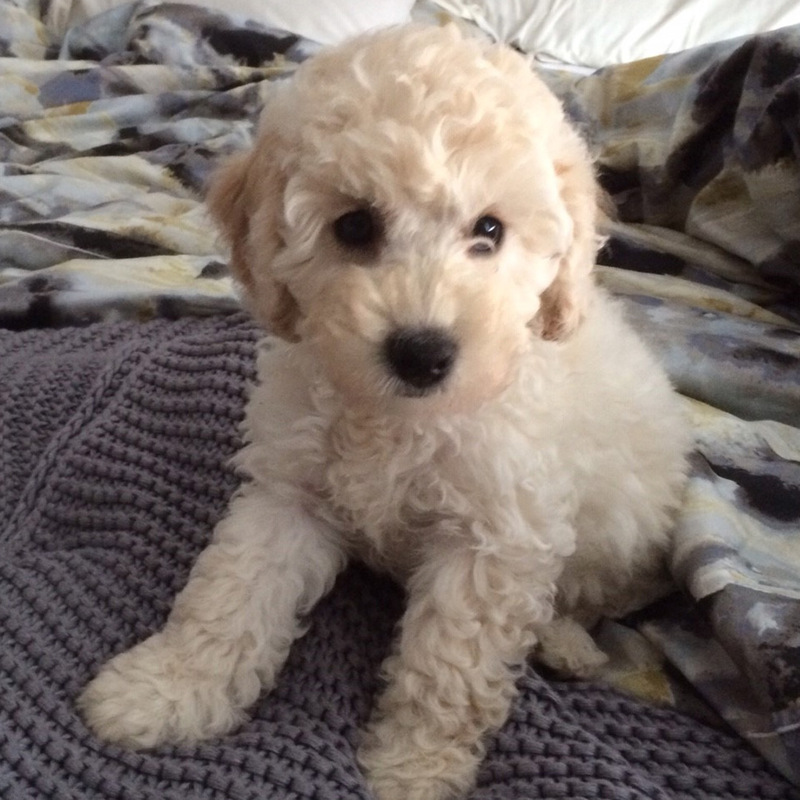 Get to know our pets below and get ready to say aww and so cute a lot! Firstly, we would like to introduce you to Frank the pug. Frank is only 2 years old, his mummy tells us that he hates the cold so loves snuggling up to keep warm. Here he is all wrapped up in his Christy Karina throw probably awaiting his cheese on toast as that’s his favourite treat! Here we have Lady. Lady enjoys snoozing on the very best linens although her very expensive basket is only to the left of her, it doesn’t even get a look in when she knows that she can curl up on her humans Christy bed linen. 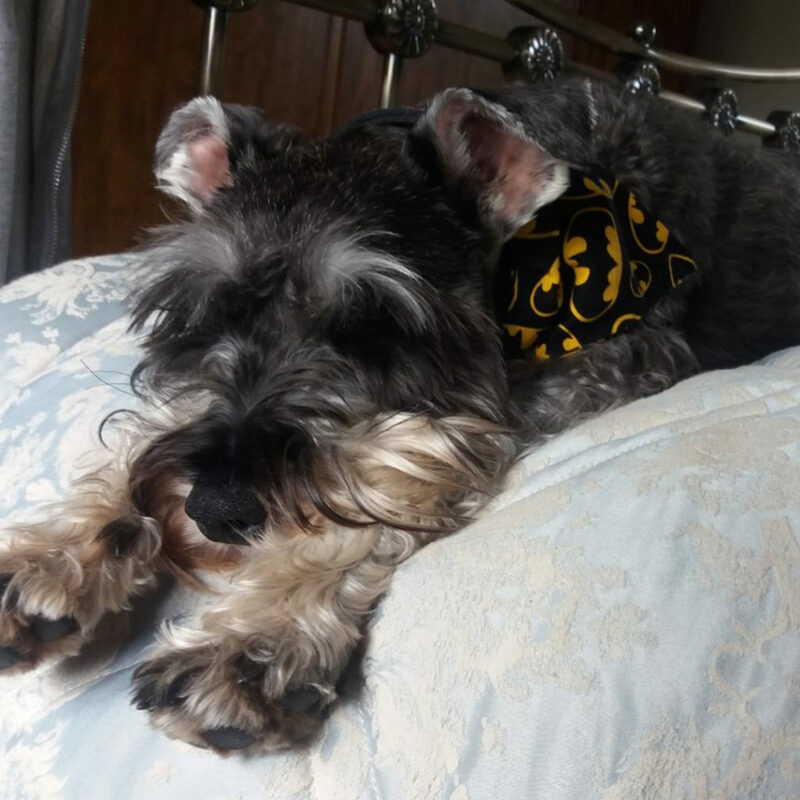 This isn’t any pooch taking a little nap on Romeo bed linen… This is a Batdog pooch, a superdog amongst the rest and it is clear to see from Bachus’ position that he is clearly taking a flight in his dreams. Batdog to the rescue! 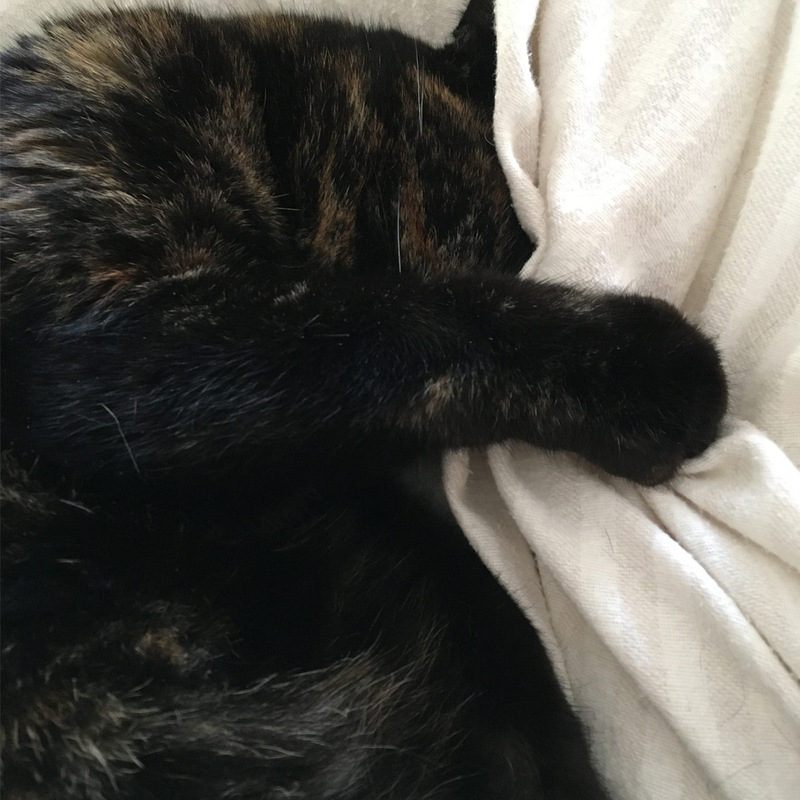 Being a photogenic cat, Treacle has many poses which she turns on for the camera. Her mummy has told us that Treacle calls this pose her ‘don’t make me get up’ pose and we do not blame her! 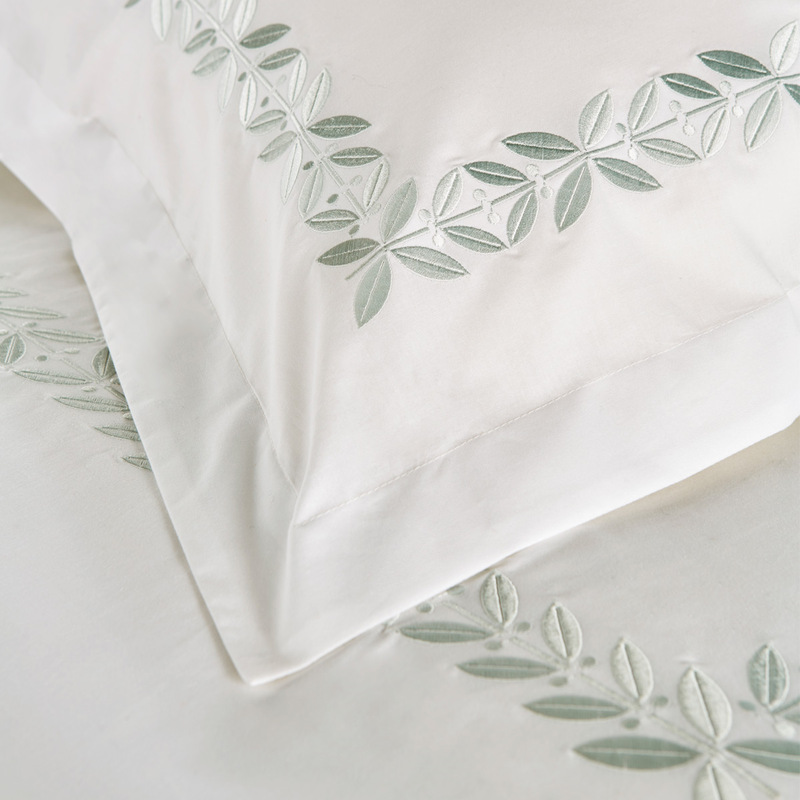 Christy bed linen is just too good to leave at any time of the day. 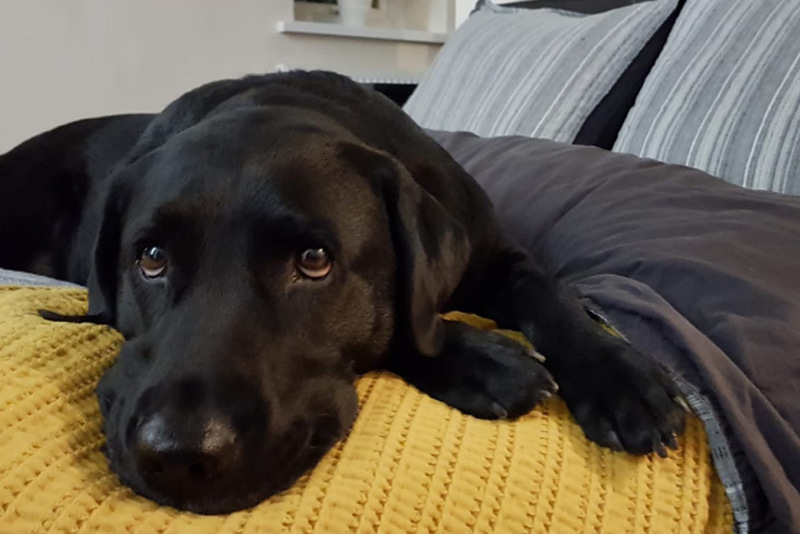 Now, Christine did start off by not allowing the dogs on the bed… but look at those puppy dog eyes, it’s hard to say no and Tyah just loves her Oslo throw! Move over human, this is my bed now! 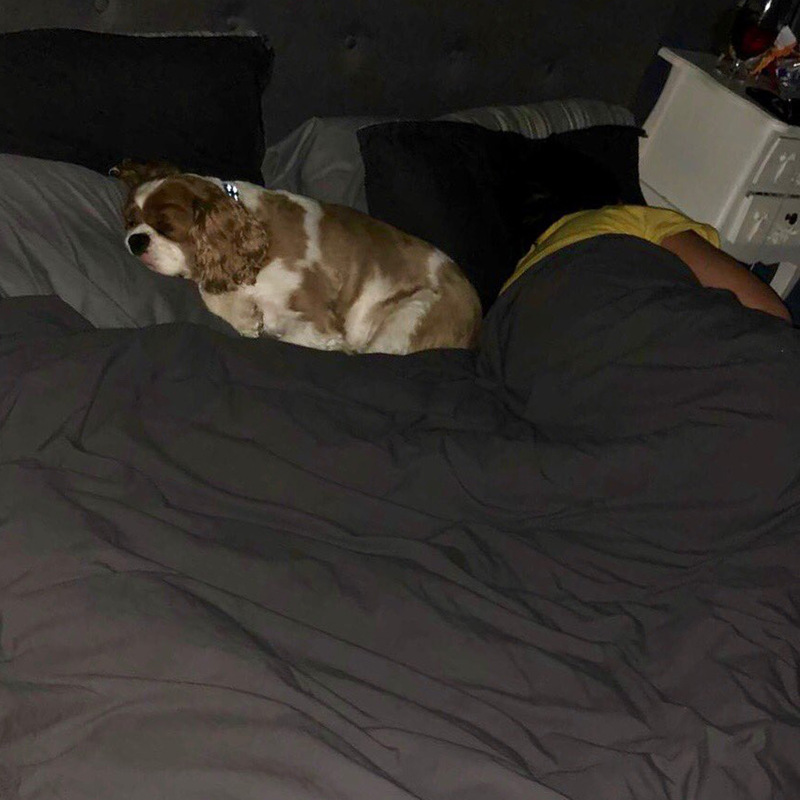 This doggo is certainly a royal; Harry the cavalier King Charles often wonders why the humans want to share his bed of Bude Christy dreams. Ted does not like early mornings. In fact Ted usually lies in until around 11am in his Coniston bed linen and then he STILL needs a little encouragement to leave and go for a walk. His mum and dad are rather jealous of this as Ted usually spends more time in their bed than they do. What a round up of beautiful pets. 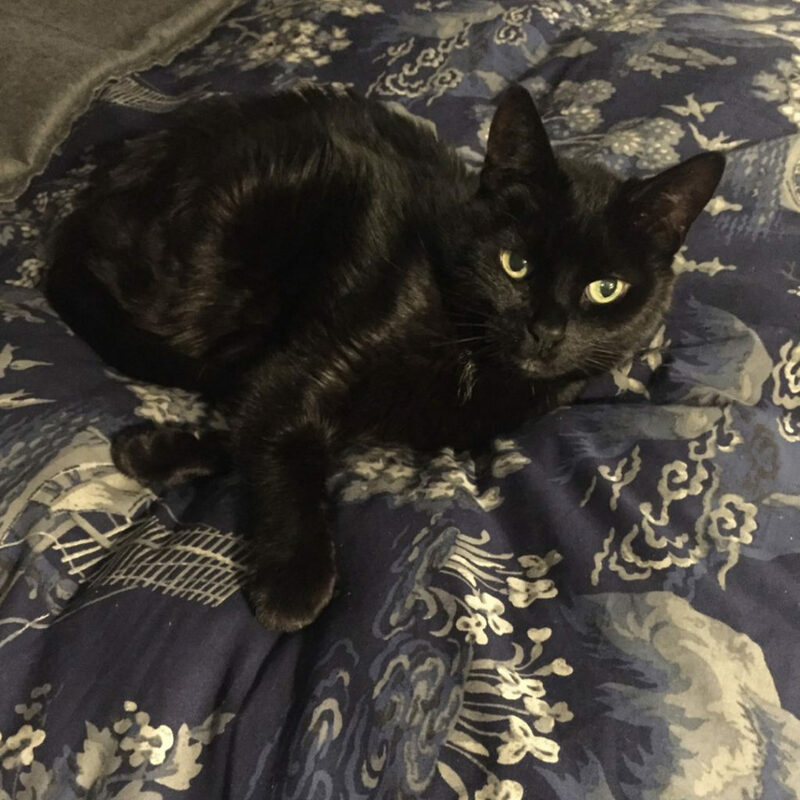 Make sure you are using the hashtag #MyChristy when you share your photographs of your furry friends on Instagram so we can like and share these! It is officially freezing cold up North, naturally at this time of year. When your alarm goes off and you have to get out of bed it can seem a bit daunting, especially when you’re stepping out into the cold air from your lovely warm bed. It’s true, January has been labelled one of the hardest months of the year. Christmas has gone, New Years is over, and everyone is back to work. But that doesn’t necessarily mean that this month has to drag. We are determined to make the most of it. 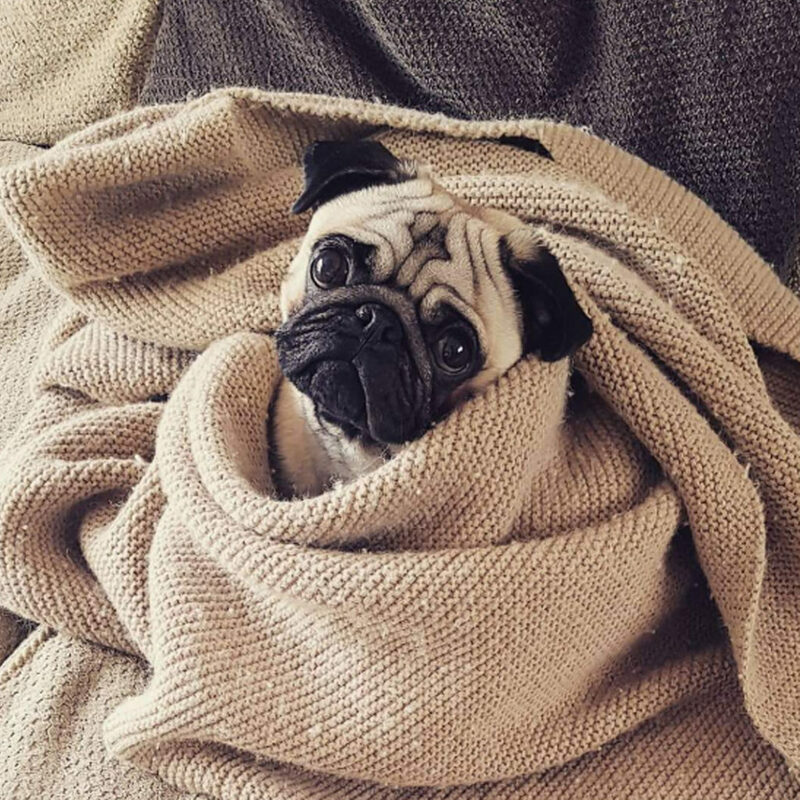 Whilst it’s too cold to walk outside, it is your perfect excuse to sit tight, tuck in and snuggle up with your family or friends and enjoy the warmth. Or, if you’re fully motivated to ‘get fit’, then head to the gym with a friend – just to make sure that you don’t bail (yes, we have all been there and have done that so there is no shame in admitting it!). There are multiple things that you can do in January that will help to lift your mood, whether this involves relaxing or pumping some iron. So say goodbye to drab January, and say hello to dreamy January! Is your popcorn at the ready? Film nights, who doesn’t enjoy them? And if you have one every Friday then it is essentially equivalent to a cinema trip. It’s also a great way to socialise in a fun, cost-effective way. So call your girls, call your guys, and sit on the sofa. Grab a blanket or a throw and pass over the popcorn – or crisps… or both! – and put on a fun loving film. Blissful. The classic New Year’s resolution? Getting fit. A great way to feel less sluggish at this time of year is to get your blood pumping, arms shaking and legs moving. Exercise releases endorphins so, naturally, you feel better post-workout. Also a healthier option than a ‘quick-fix’ sugar hit. Fabulous. So, this year, we challenge you to sign up to try something new which is fitness related. Whether this is a gym class, spinning, salsa dancing, you name it – just get yourself out and moving! You’ve got this. 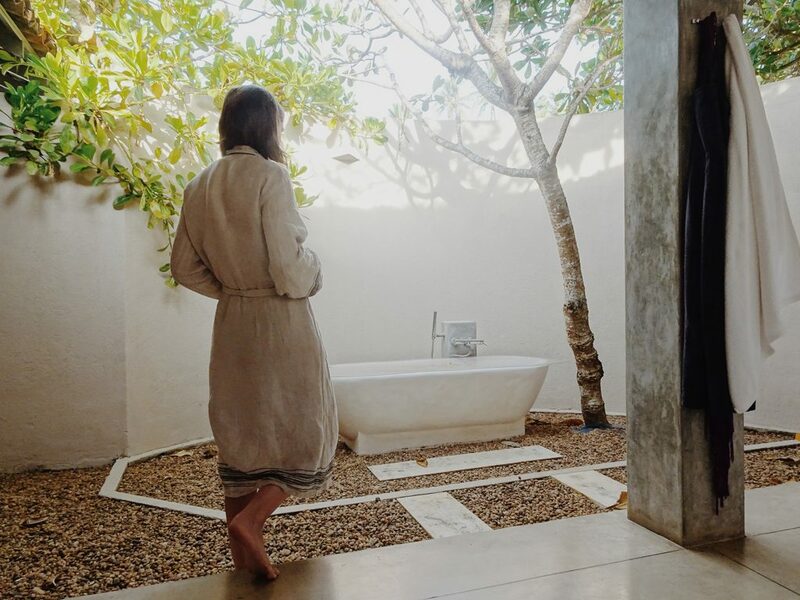 The sounds that surround a bubble bath are comforting aren’t they? And so is having a bath. More time consuming but ten times more relaxing than a shower. 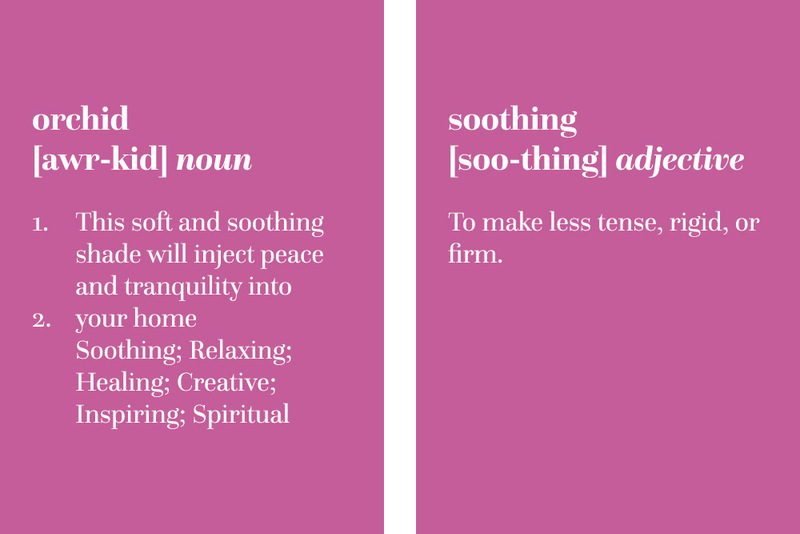 Unwinding and de-stressing is important after a long day and, when the days are darker for longer, tension feels higher. So, we find that a bath helps us out a lot during these days. So select a Podcast, or hit play on your Playlist, and breathe in the tranquillity. Yoga is a thing. A good thing. Last year there was a growing trend in Yoga videos featuring on Instagram and YouTube. They were everywhere, and we loved it! Yoga has multiple health benefits, both physically and mentally. Yoga allows yourself to escape the everyday stresses by focusing on your breath, and stretch to release any tension built up throughout the day. With workouts which can last between 10-30 minutes, you can easily incorporate it into your routine, both in the morning or at night. A new hobby doesn’t hurt. New Years is often a time for reminiscing, and quite often we look back at years gone by at ‘the good times’. But we can easily forget that the current times can also be good times. If you find yourself looking back and thinking ‘ohh, I used to love drawing’, or ‘I have always wanted to go there!’ then do it. Just this time period in January where the world is still half asleep, and maybe still recovering from the madness around NYE, to research and book activities. Try an art class. Explore some stately homes. Visit some museum exhibitions. Book a weekend away… Have some fun! After the festive indulgence, in typical fashion, we brought in the New Year with a work out from our friends over at Be Fit Motivation. 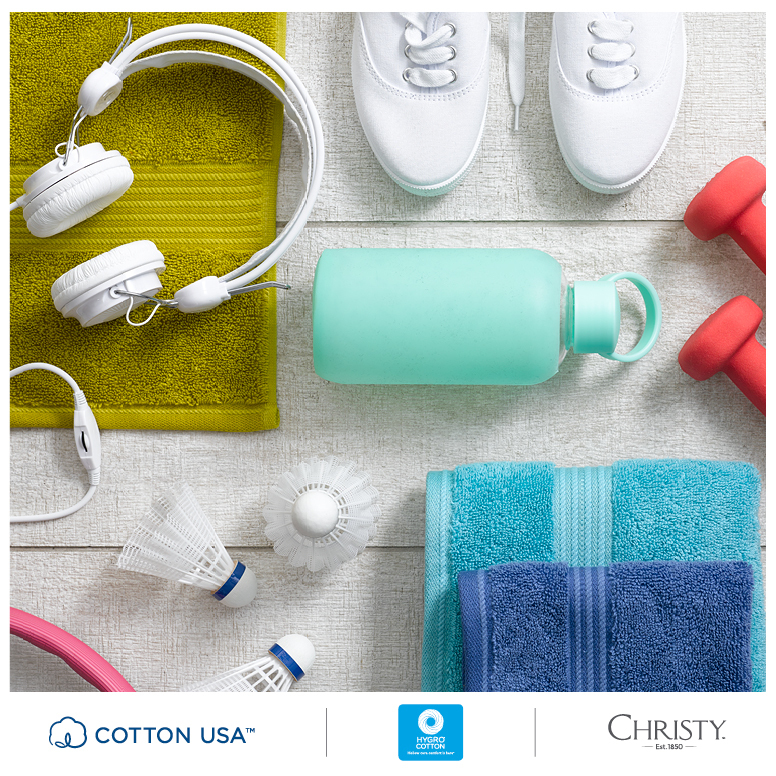 Who knew you that Christy towels would be the perfect get-fit partner? 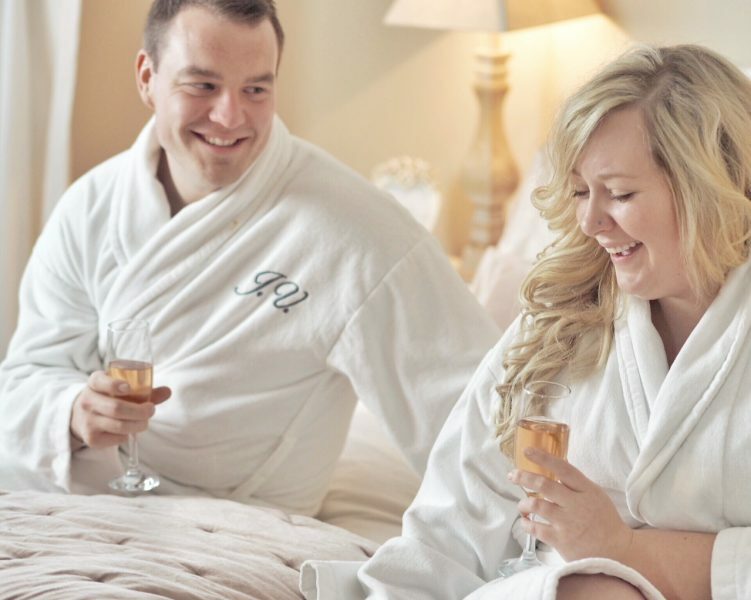 We made Valentine’s 2018 extra special with our bespoke personalisation service on our best selling luxury bath robes. Image by Charlotte Amor Valentine. Read blog post here. 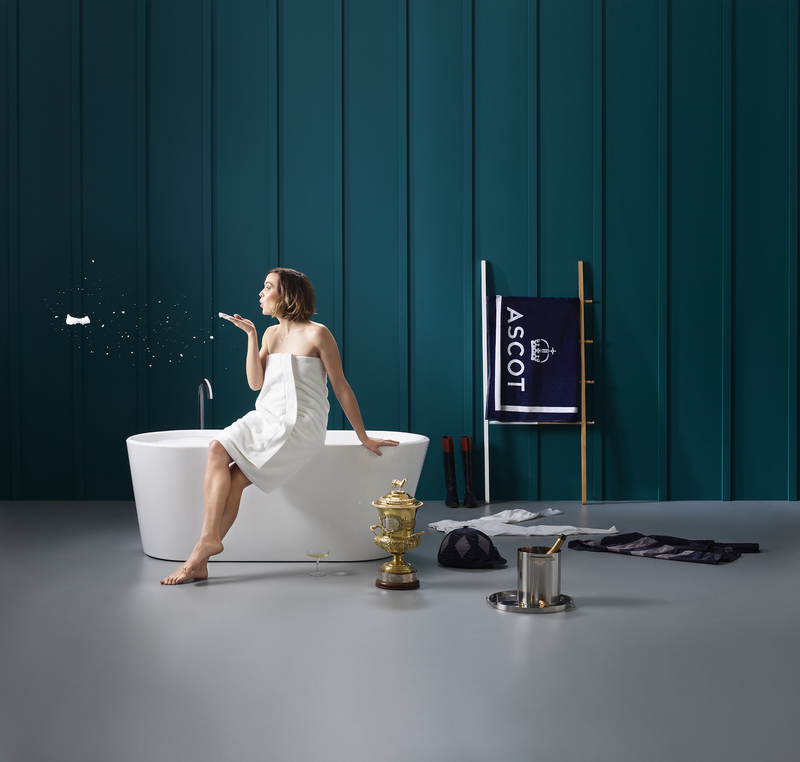 Decorated Olympian and Jockey Victoria Pendleton become a Christy ambassador for our Ascot collection – she wears our towels so well! Read our Q+A here with Victoria here. 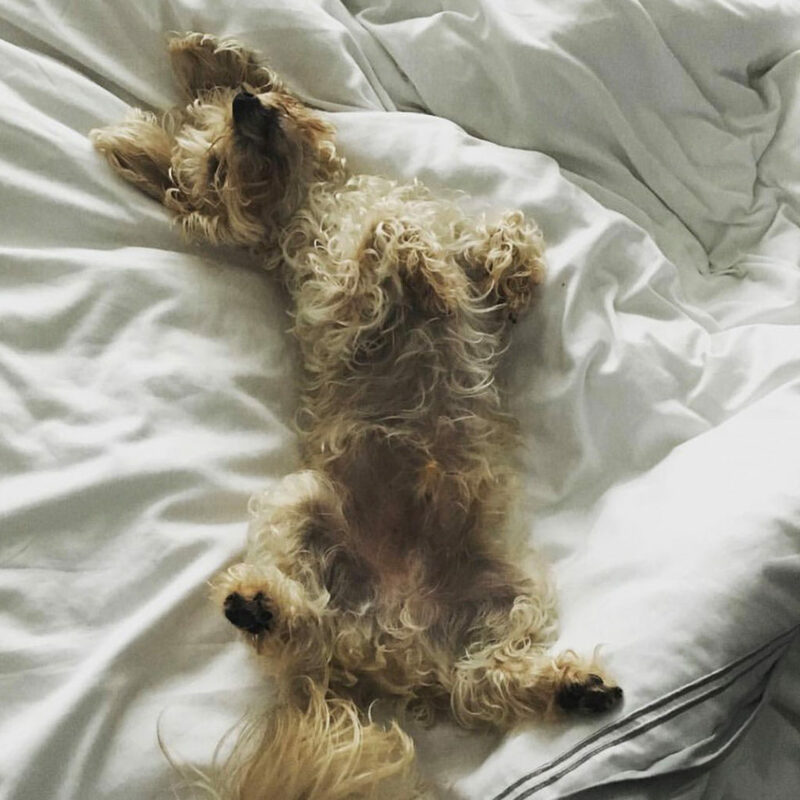 In April, we were over the moon that the one and only Tom Fletcher was sleeping in our Christy Junior bed linen! May: Christy Customer… Zoe Sugg! Team Christy did a little squeal one Friday night in May when we saw our coveted Jaipur throw on Zoe Sugg’s bed on Instagram. #BedroomGoals at it’s finest! A summer of sport began with the most prestigious racing event of the year, Royal Ascot. As the official towel licensee and supplier to Ascot, we were proud to present Frankie Dettori with his very own monogrammed towel to celebrate the occasion. Get your own towel here. 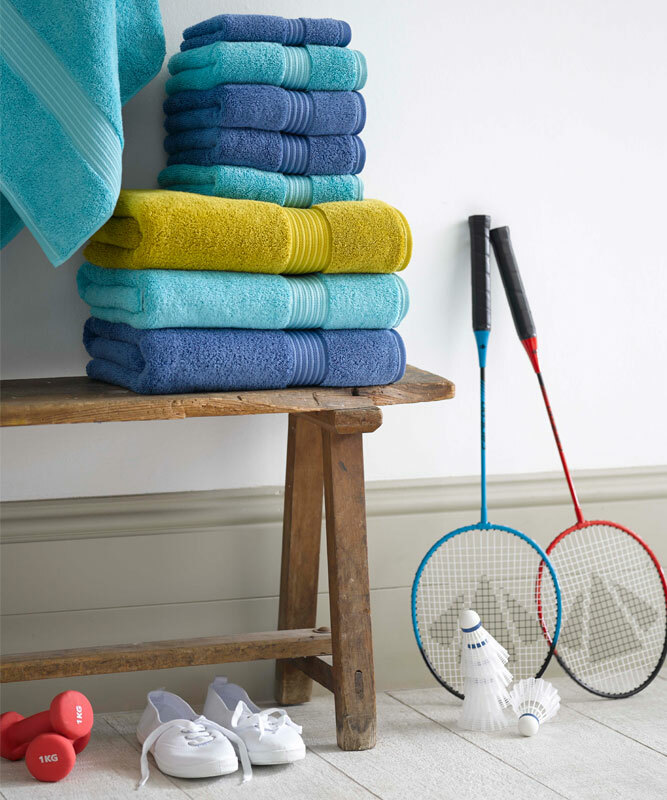 #ChristyLoves Wimbledon – who doesn’t!? 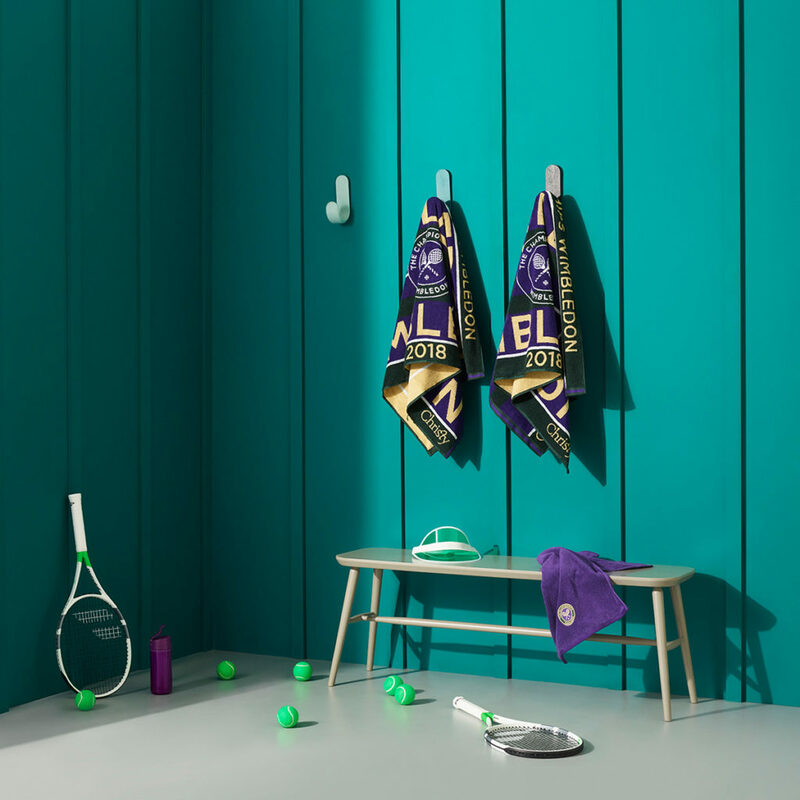 We were thrilled to provide the fantastic Roger Federer with a commemorative towel to celebrate his eight wins at Wimbledon. 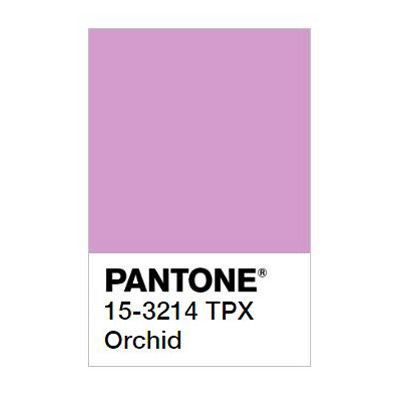 The hottest colour of the year was a sell out! This towel was a must have for any fashion enthusiast. 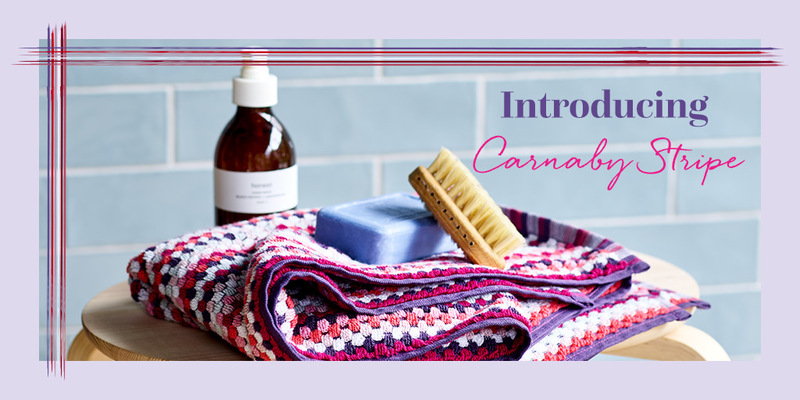 Be quick, we still have face cloths and bath mats left with 30% OFF! 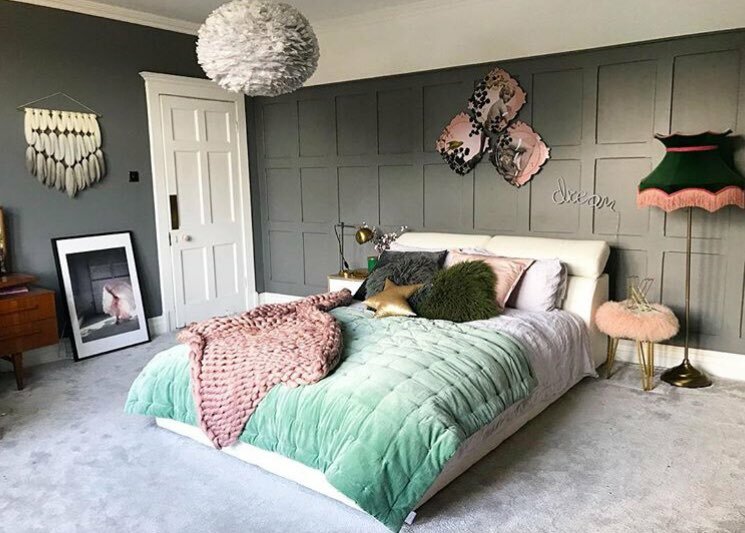 We showcased our Christy bed of dreams at the fabulous Northern Blog Awards, an event which celebrates blogger talent in the North. Doesn’t this photo just make you want to jump in? October: SPOTTED: Christy Towels Everywhere! 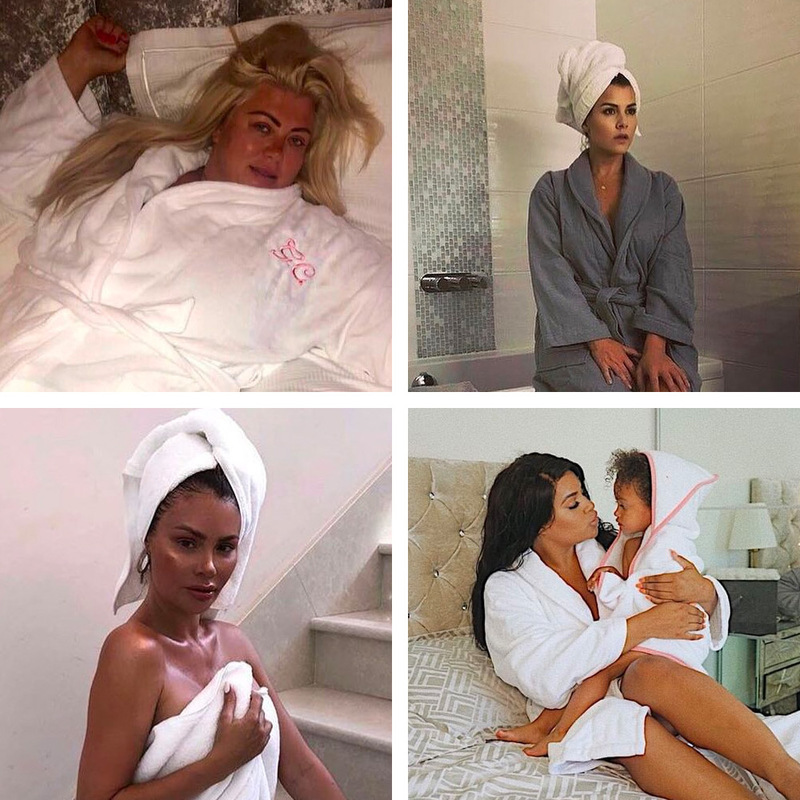 Our famous towels are loved by celebrities. 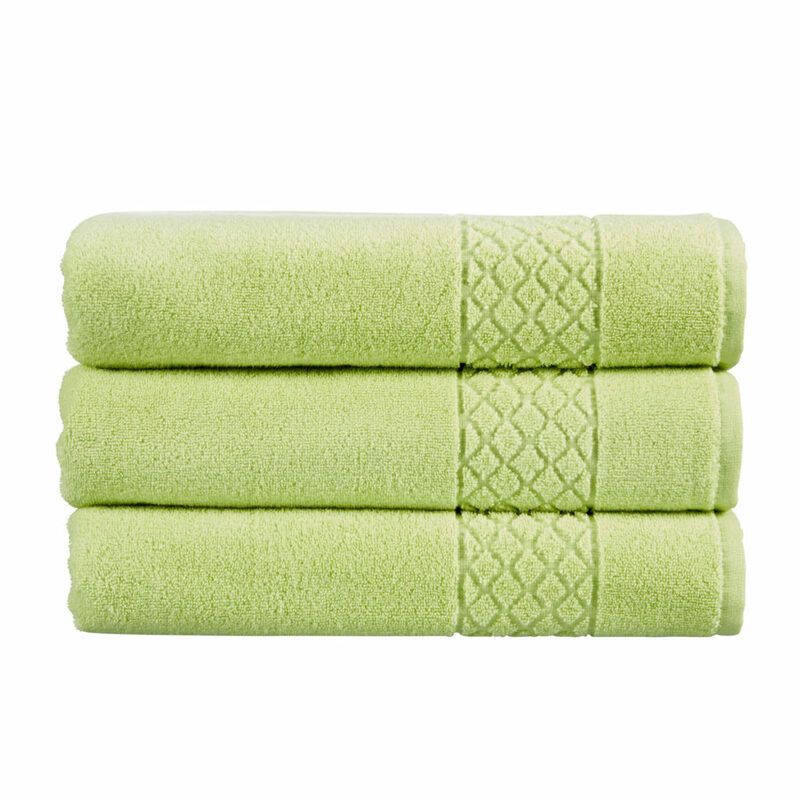 You can enjoy the same soft feeling as them by indulging in our Supreme Hygro towels. 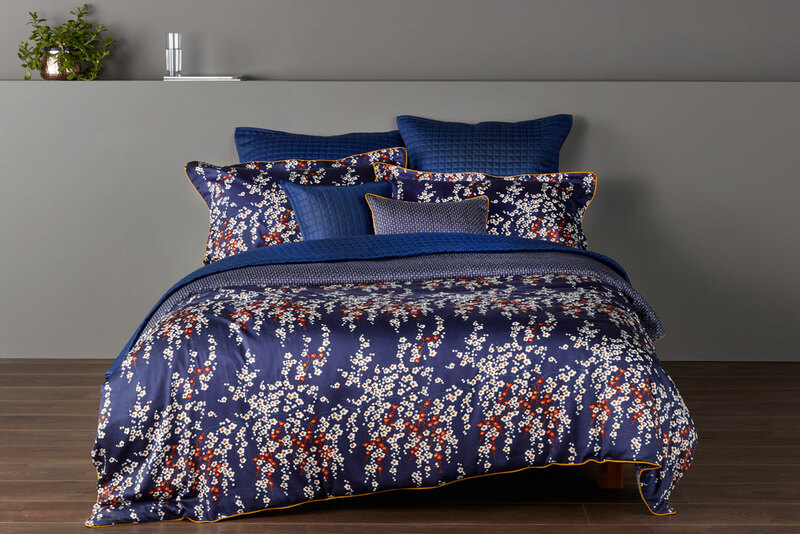 New in AW18, our Morrello Blossom Bed Linen a showstopper of the season. It was even featured in the Metro newspaper! Our Facebook hosted competition, 12 days of #ChristyChristmasRedefined, provided Christmas cheer through luxury product giveaways. Make sure you like our Facebook page and follow us so you can be one of the first to enter our new competitions! Sunshine beams through the open glass window panes, which replace the standard brick walls found in a home, of the location space. The modern building is open-plan with a design aesthetic that is an edgy take on Scandinavian design. Deep mahogany wooden feature walls, paired with dark navy walls, create a cosy yet modern atmosphere. A perfect fit for a winter collection. Shoot days are full of excitement, anticipation and movement. It is an atmosphere that we thrive in, a dynamic setting which gets the creative ideas flowing and adrenaline pumping. Boxes are unpacked. Product is steamed and ironed. The bed is dressed. Lighting is set. Camera is in position. It is time to call Action! Our NEW AW18 range draws from a wonderful array of inspiration. Featuring beautiful rust tones, and icy silver hues, this new collection creates a warm wintery feel in the home effortlessly. We love the idea of layering up. Creating a space which you can snuggle up in and enjoy Christmas films and hot cocoa. Combining knitted, cotton and cashmere textures, and collaborating multiple tones, it is easy to create a Winter retreat. Thus, our winter photoshoot inspiration. For this photoshoot we wanted to incorporate as much warmth as possible – there is no better feeling then getting into a warm bed when there is ice greeting the grass overnight! 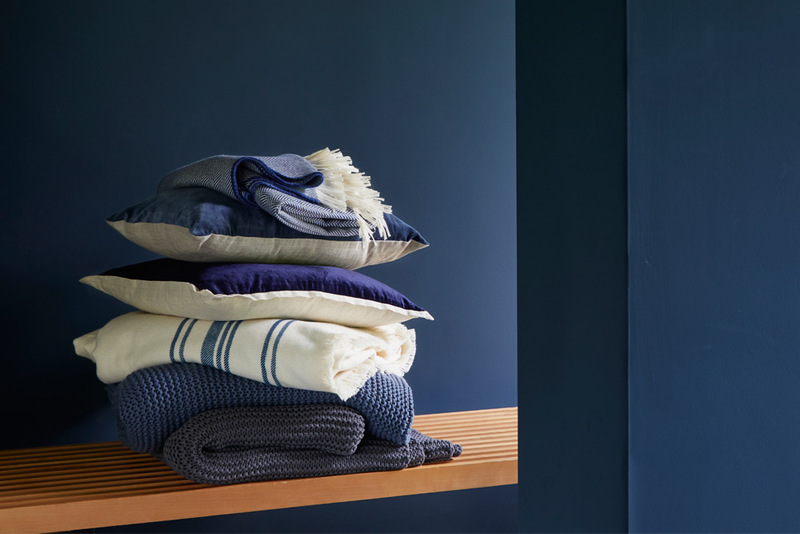 Our winter warmers come in the form of knitted throws the year. 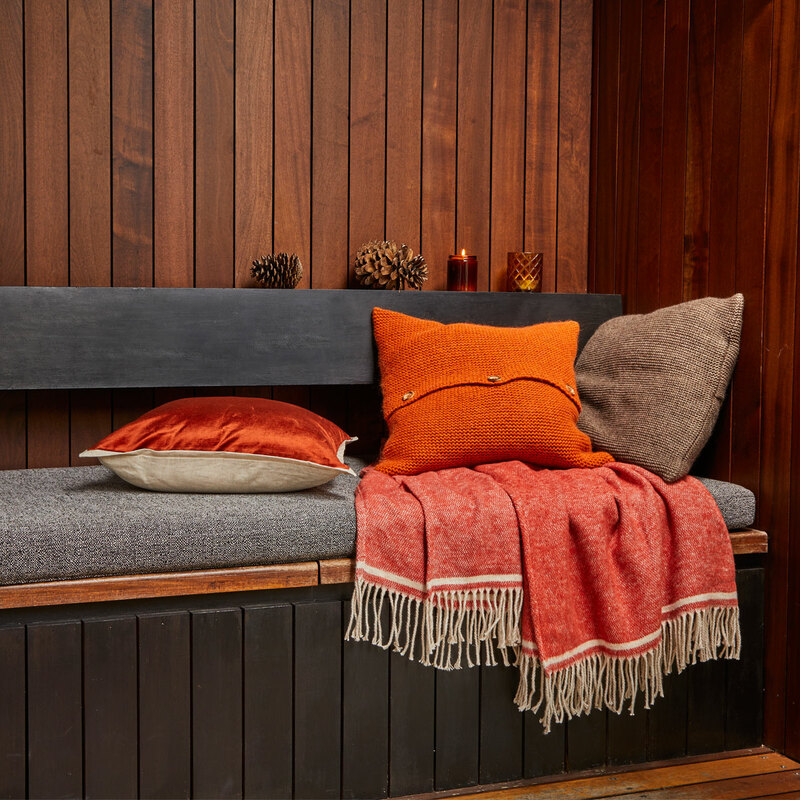 Our Agnes throw in Rust, and our Oslo throw in Ecru, embrace autumnal hues and high quality materials. Silver is our colour of the season. 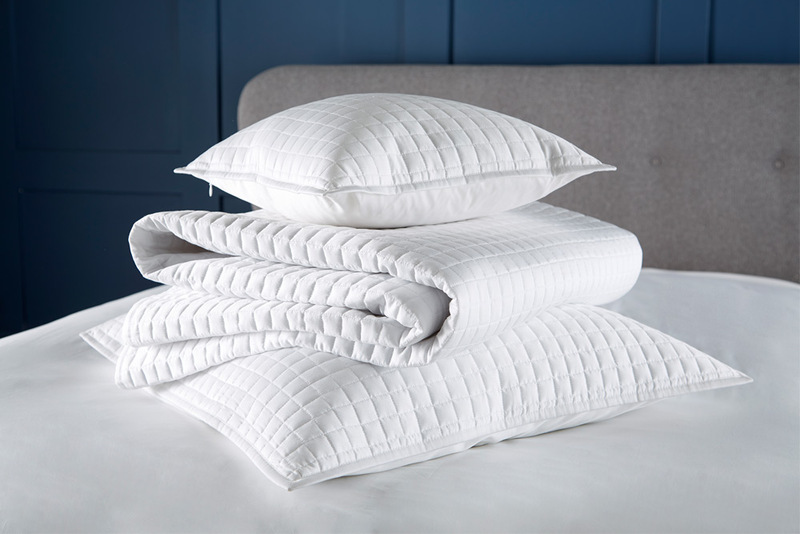 The beautiful icy tones of our 300TC Sateen Stripe bed linen, coordinated with our premium 900TC Sateen Plain Dye, create a bedroom fit for a Winter Queen. Against the warm mahogony wall, paired with brass and concrete décor, the bed linen sings and instantly becomes the main focus of your bedroom – rightly so. 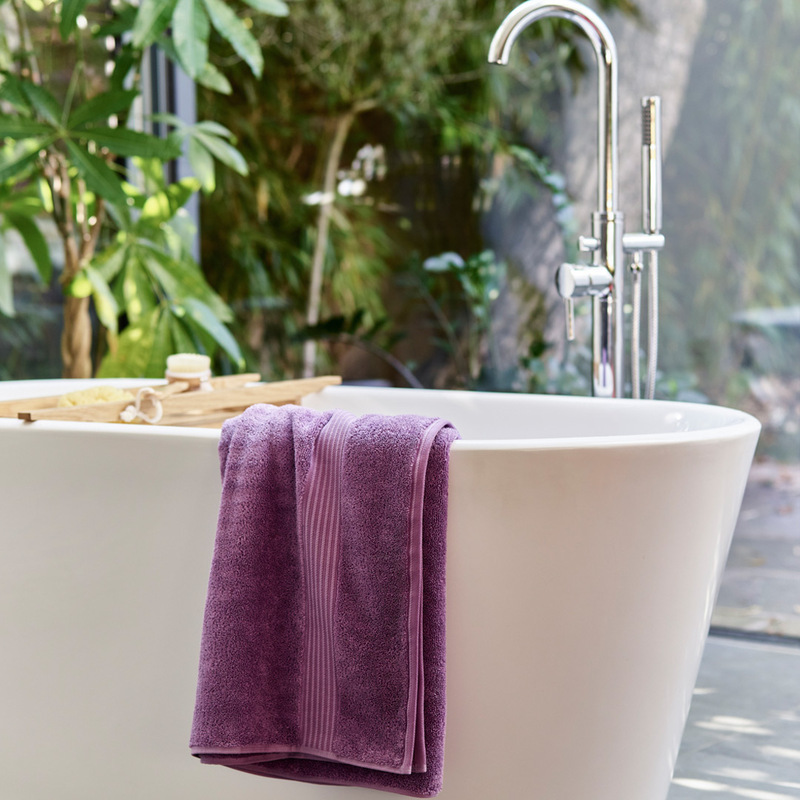 To add a pop of colour, we decided to incorporate our luxurious Jaipur Throw in Magenta. A simple way to lift the intricate detail. Don’t just take our word for it though, look at how cosy our beautiful model Lara looks inside this bed of dreams! Need some more inspo? Take a look at some other ways to make your home a winter haven this year. Our favourite colour this month is blue and these striking shades of Indigo and Midnight are full of depth and are extra special. 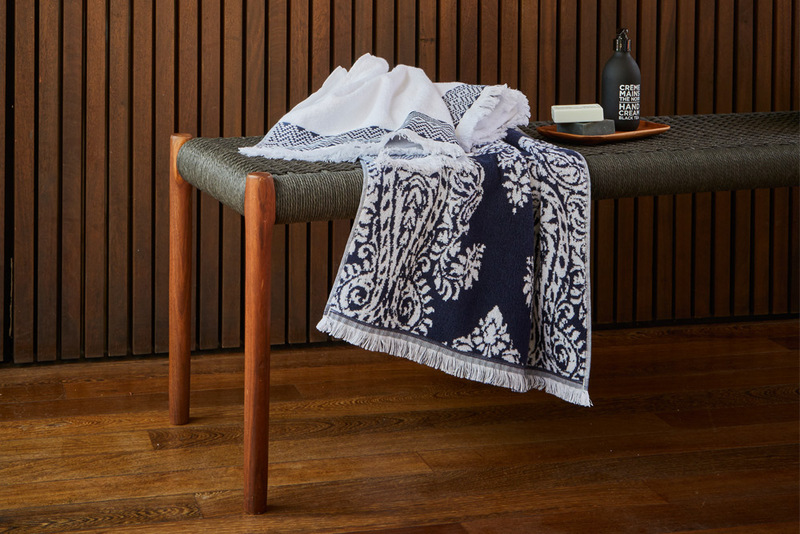 Whether you opt for silky and velvety textures or a paisley pattern is more your style, we’re sure you’ll love our Horizon cushion in Midnight and Siam bed linen. 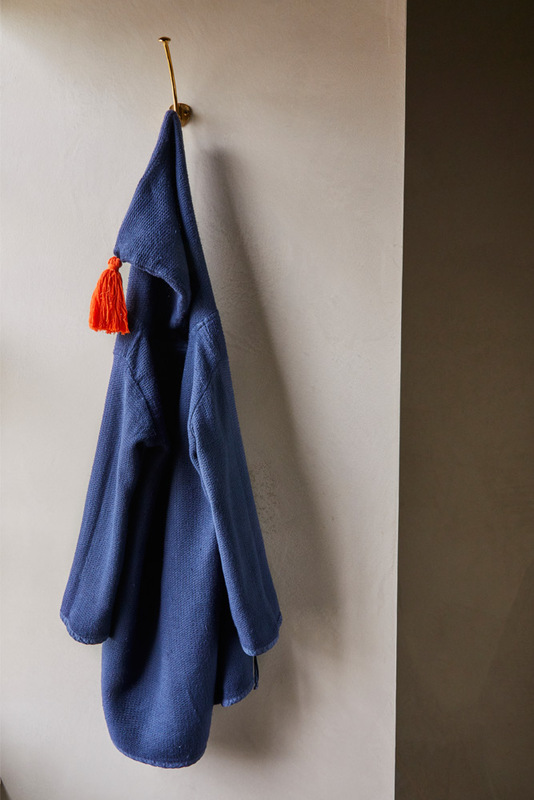 This cosy Acorn robe from our Junior collection is perfect for before bedtime cuddles and snuggles after a bubbly bath. Crafted from the finest of fabrics, this robe boasts a self-tie belt and super soft hood with tassel detailing. 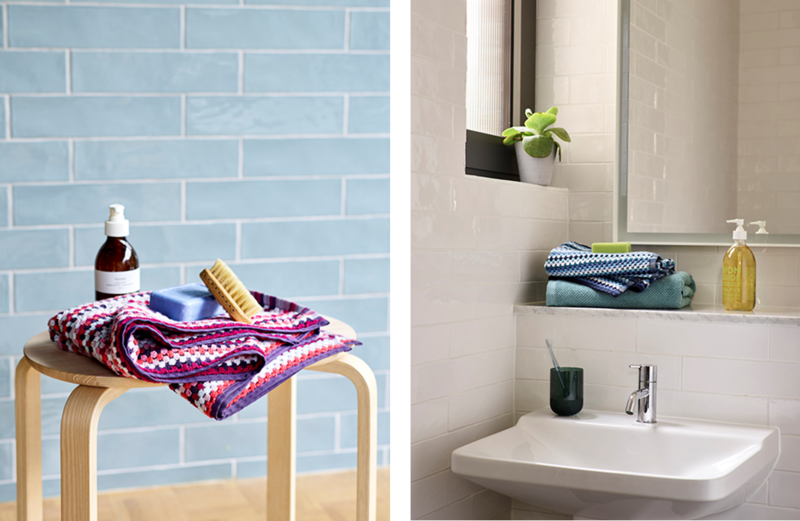 Wrap yourself up in our Santa Fe towel, with its striking woven border design and lovely handcrafted feel, it’s a sophisticated way to add pattern and colour to your bathroom. Now we know how it is when the days start getting that little bit shorter and nights that little bit cooler. Those late August barbecues that end up inside as the air begins to drop and your guests enter your home to end the party. 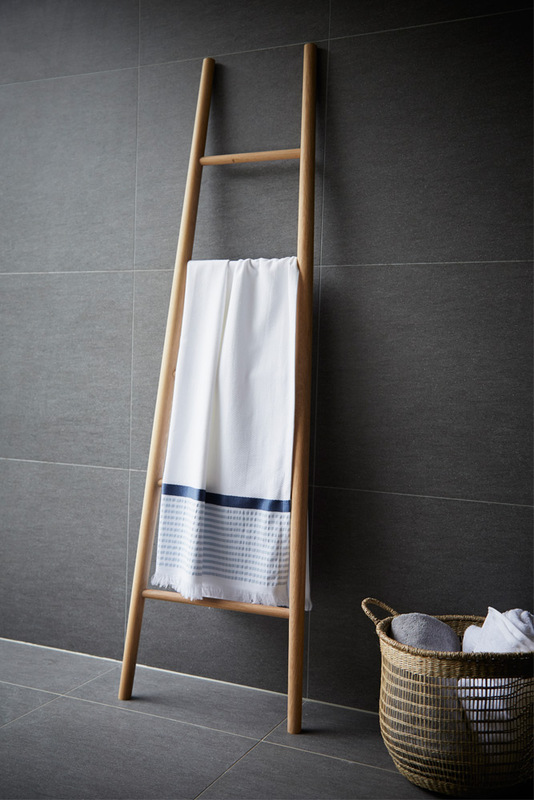 A setting that seems rather bare as your comfier statement accessories are still away in your linen cupboard. Well fear not because this season’s statement throw has arrived! AND it’s available in four stunning colours! 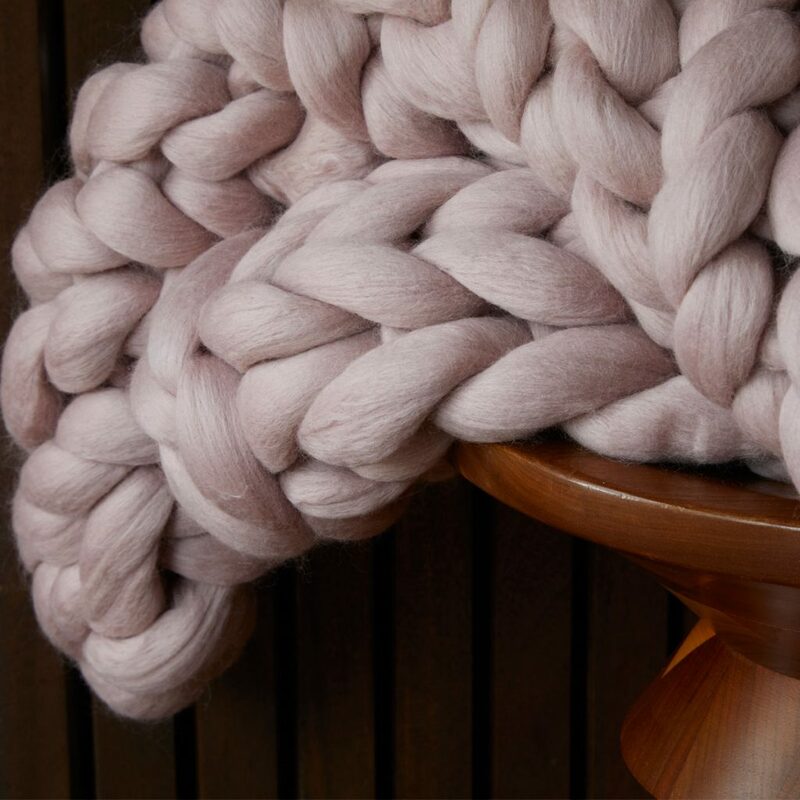 Our limited edition Chunky Knit throws are all beautifully hand made in Britain. Each piece is knitted completely by hand from giant yarns of Merino wool which shows in the intricate detail of each piece. 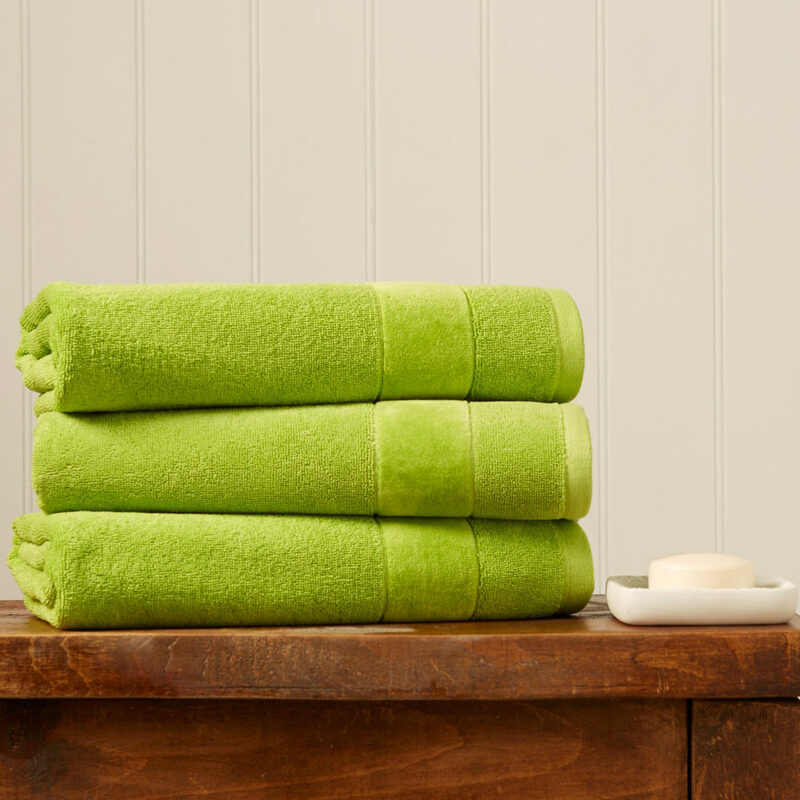 These throws are one of a king and feel just as good as they look. 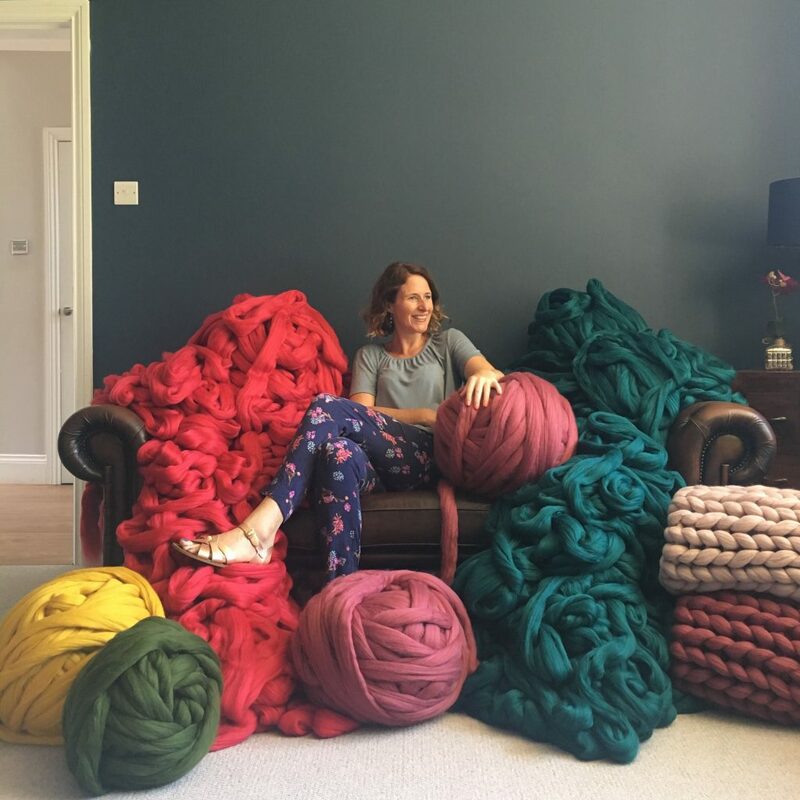 The Lady behind these giant knits is Miriam Evans. 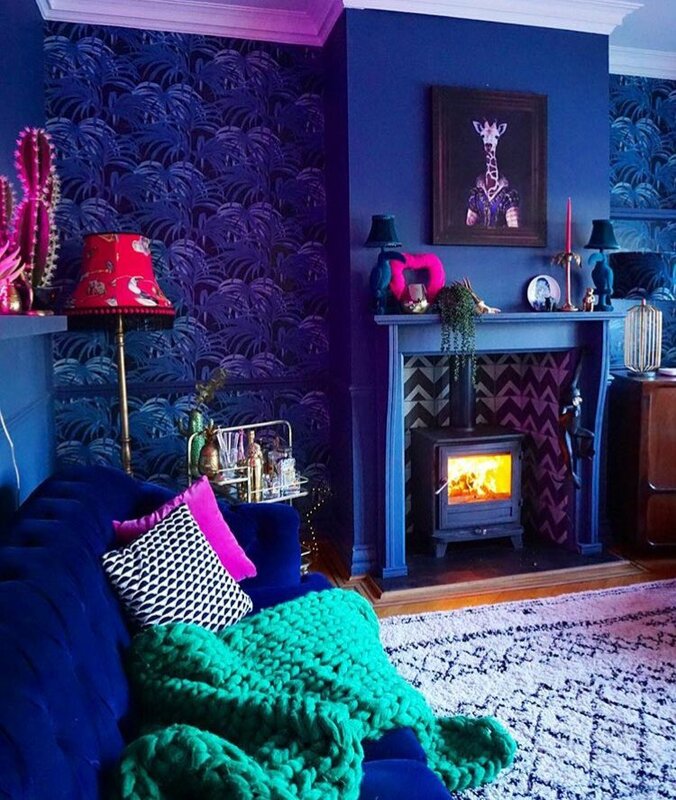 Miriam creates these exquisite throws in her home studio in Leeds using just her arms and hands. We know you were imagining gigantic knitting needles and huge balls of never ending yarn, but were afraid not. However, they are made from the chunkiest of pure unspun Merino wool which is sourced locally in Yorkshire. The reason that Merino wool is used is because it is naturally stained and is also water and odour resistant. 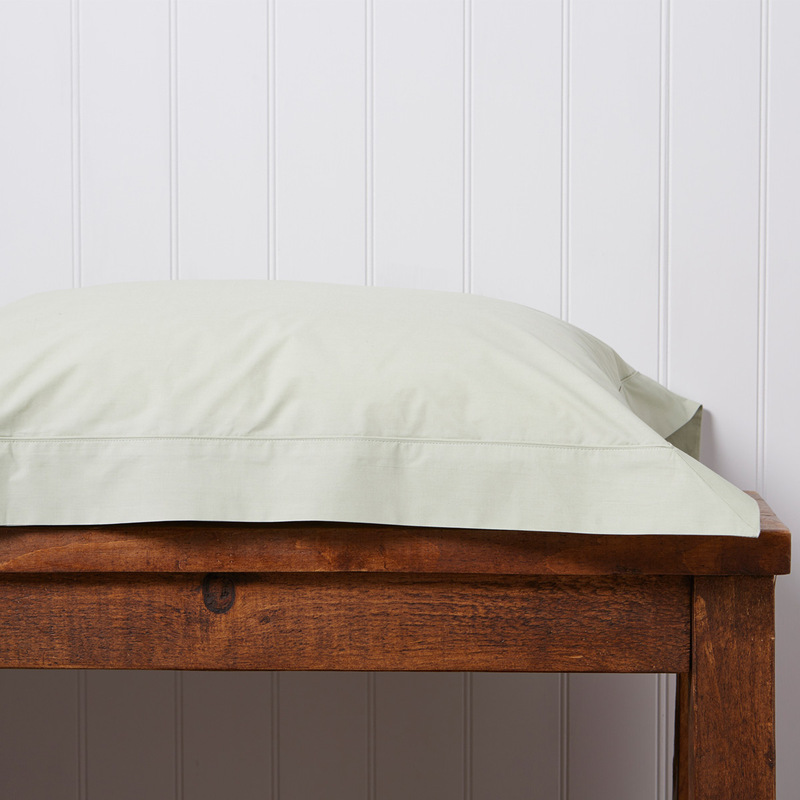 Meaning each throw is hypoallergenic, naturally flame resistant AND anti-static. The perfect accessory for your bed. Does it get any better?! Dust free? Child proof? We’re sold. 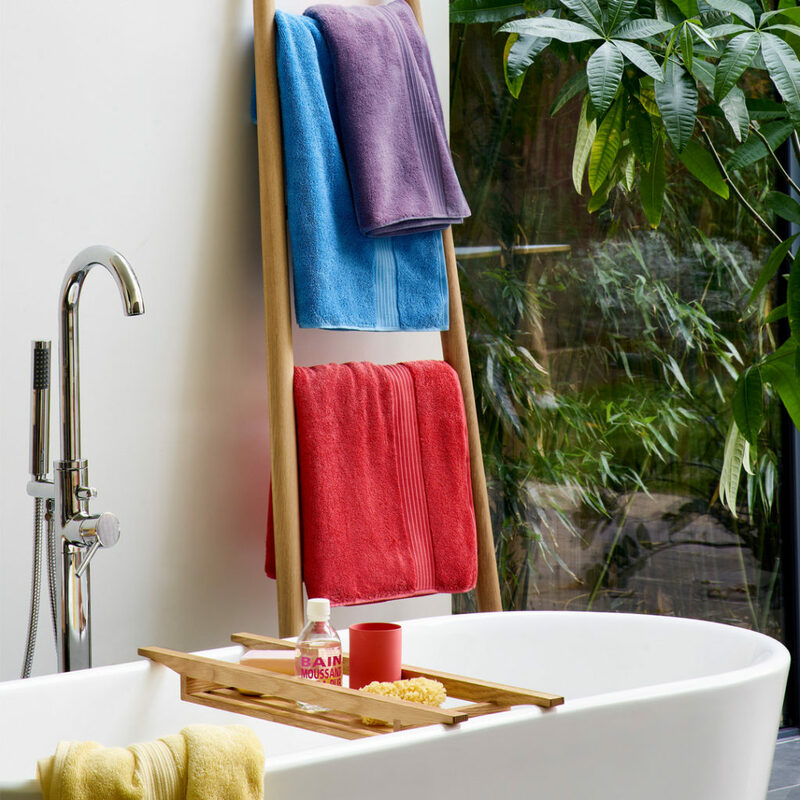 Well we don’t like to boast but it does get better because we have a colour to suit every home, room and person! 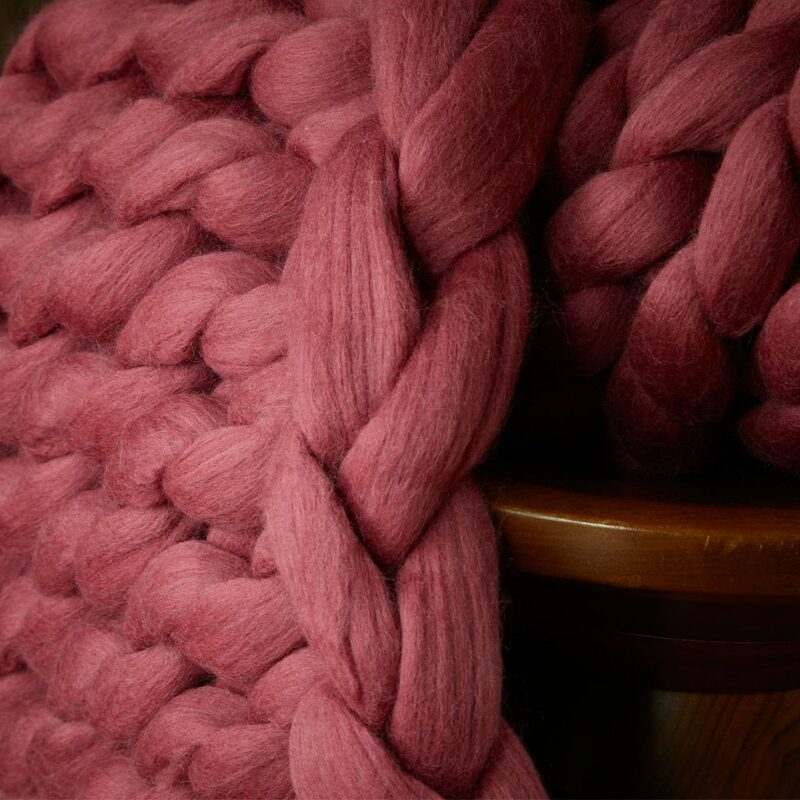 For the softer toned lover we have the Dusky Pink throw. This is a shade of dusky mink with the perfect hint of pink. Not too much, but just enough! Be Bold. Be Daring. Be Carmine. This electric pop of colour is not for faint-hearted and will certainly make a statement in any setting. 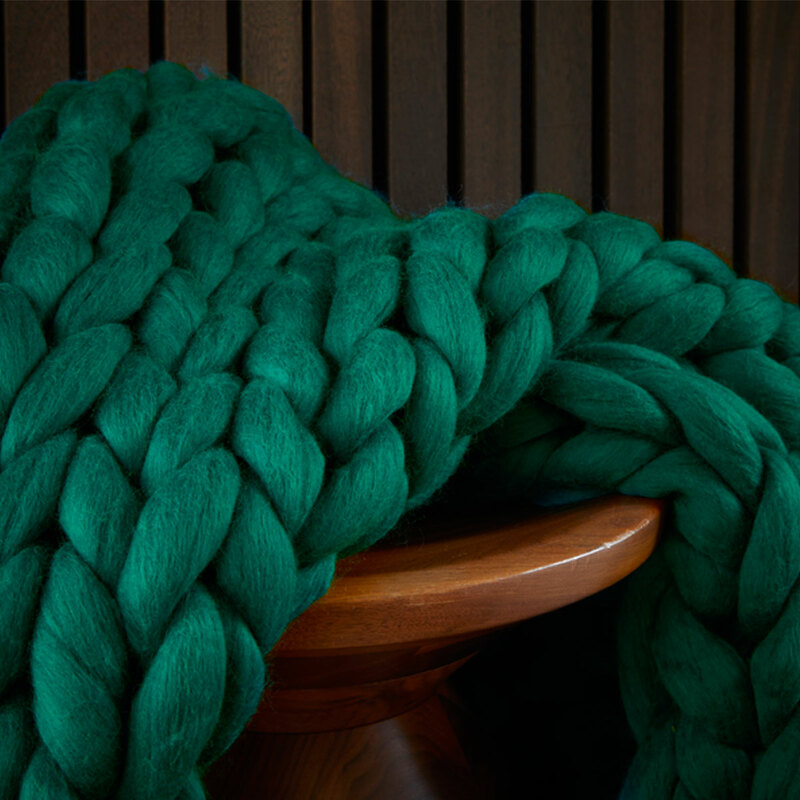 Taking it a shade darker… The Chunky Knit throw in Dark Teal is such a stunning shade, similar to the head of a mallard. It brings warmth just by looking at it. Deep, dusky and bang on trend. 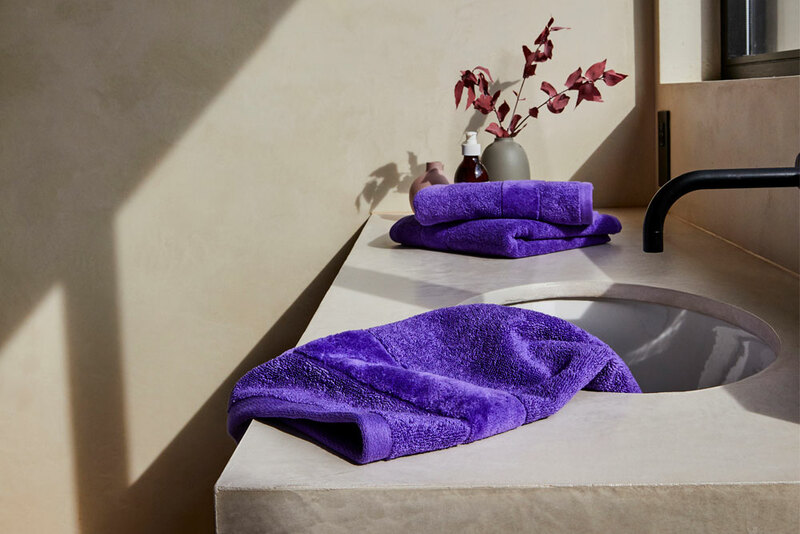 The Mulberry coloured Chunky Knit Throw is a fashion statement alone, so imagine how amazing it would look paired with a set of Christy bed linen. Exactly what dreams are made of! The only downside of this piece you ask? Well it is Limited edition meaning there are only a handful of these show stopper throws available. So make sure you grab yours before anybody else! How could you resist?! Look how stunning they look in the home. 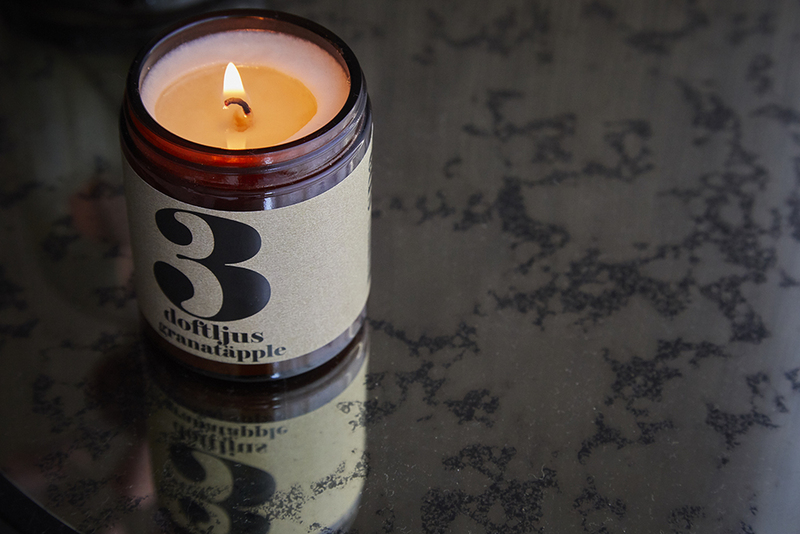 A versatile must-have which shines through in any setting. As seen on Come Down To The Woods Instagram. 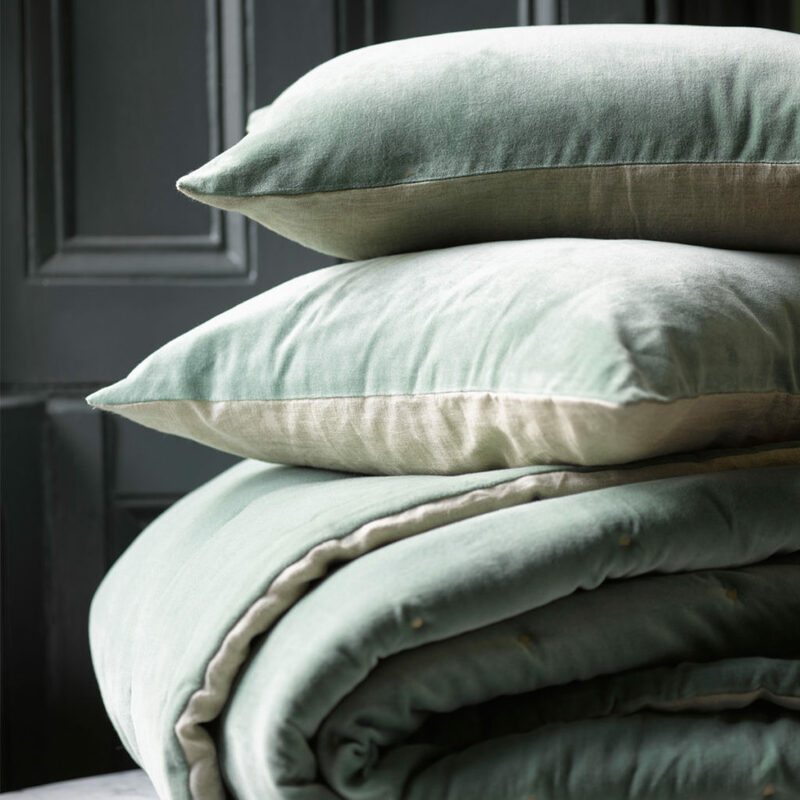 Layered with our Jaipur velvet throw in Jade and Belgian Linen in Silver. “I absolutely love making these blankets. Merino wool is a wonderful material to work with. It’s super soft, squishy and delightfully tactile. 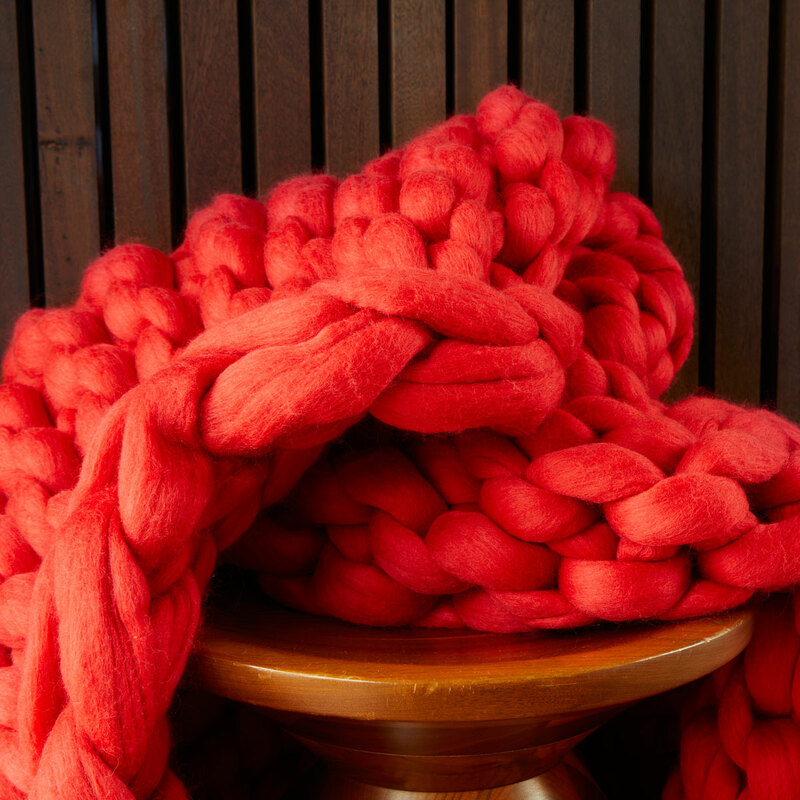 The fineness of the merino wool means that it can be dyed in incredibly vibrant colours. Using such glorious colours makes a real impact in any room, and can really pull a design together. Crafted in the simplest of knit stitches, the giant sized yarn creates tremendous texture and pattern, allowing each stitch to sing! 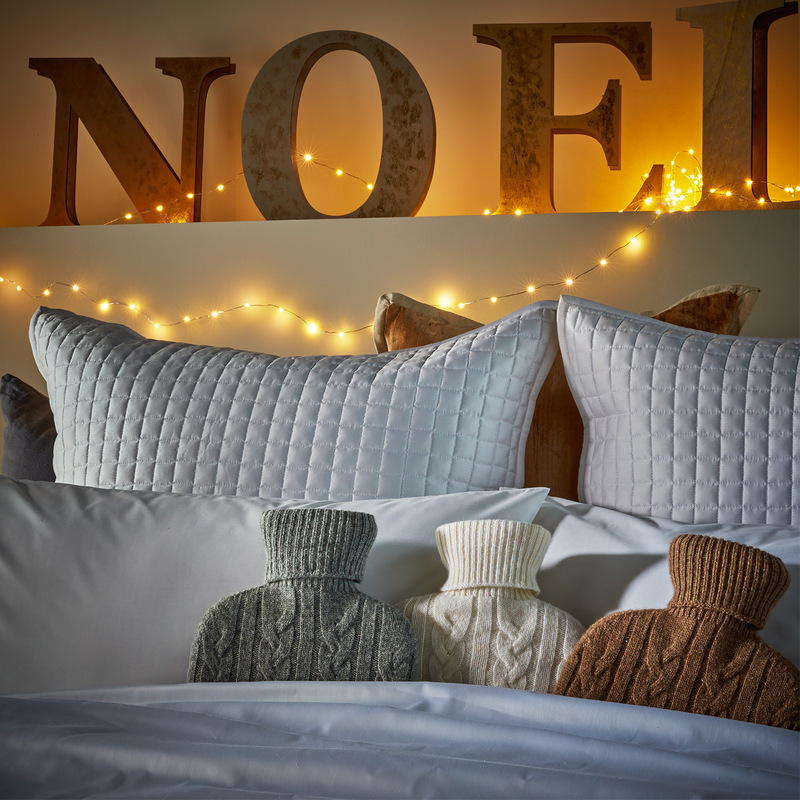 Shop our Chunky Knit Throws now whilst stock lasts.